"San" is a collective name for Khoisan-speaking nations in Southern Africa. Also sometimes referred to as Bushmen or Basarwa, their gene pattern dates back some 80,000 years, making them direct descendants of the world's first humans. The San live in areas of Botswana, Namibia, South Africa, Angola, Zambia, Zimbabwe and Lesotho. In some areas, the terms "San" and "Bushmen" are considered derogatory. 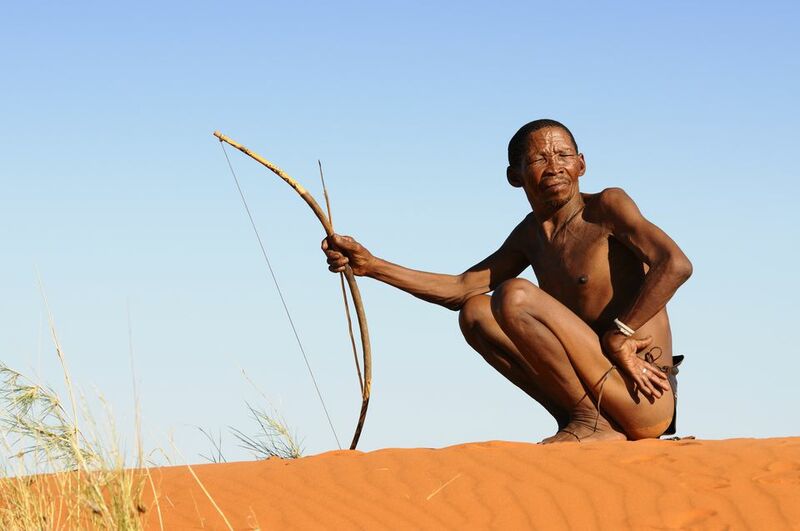 Instead, many San people prefer to be identified by the name of their individual nations. These include !Kung, Jul'hoan, Tsoa and many more. The San are the descendants of the first Homo sapiens, i.e. modern man. They have the oldest gene pattern of any existing people and it is thought that all other nationalities are descended from them. Historically, the San were hunter-gatherers who maintained a semi-nomadic lifestyle. This meant that they moved throughout the year in accordance with the availability of water, game and the edible plants that they used to substitute their diet. Over the course of the past 2,000 years, however, the arrival of pastoralist and agriculturalist people from elsewhere in Africa forced the San to withdraw from their traditional territories. This displacement was exacerbated by white colonialists in the 17th and 18th centuries, who began to establish private farms on the region's more fertile lands. As a result, the San were confined to non-arable areas of Southern Africa - such as the arid Kalahari Desert. In the past, familial groups or bands of San usually numbered around 10 to 15 individuals. They lived off the land, erecting temporary shelters in summer, and more permanent structures around waterholes in the dry winter. The San are an egalitarian people and traditionally have no official leader or chief. Women are considered equal, and decisions are made as a group. When disagreements arise, lengthy discussions are held to resolve any issues. In the past, San men were responsible for hunting to feed the entire group - a collaborative exercise achieved using hand-crafted bows and arrows tipped with a poison made from ground beetles. Meanwhile, the women gathered what they could from the land, including fruit, berries, tubers, insects and ostrich eggs. Once empty, the ostrich shells were used to gather and store water, which often had to be sucked up from a hole dug into the sand. Today, it is estimated that there are around 100,000 San still living in Southern Africa. They are divided into 35 linguistic groups and only a very small fraction are able to live according to their traditional lifestyle. As is the case with many first nations in other parts of the world, the majority of San people have fallen victim to the restrictions imposed upon them by modern culture. Government discrimination, poverty, social rejection and a loss of cultural identity have all left their mark on today's San. Unable to roam freely across the land as they would once have done, most are now laborers on farms or nature conservancies, while others rely on state pensions for their income. However, the San are still respected by many for their survival skills, which include tracking, hunting and an extensive knowledge of edible and medicinal plants. In some areas, San people are able to live off these skills in a different way, by teaching them to others at cultural centers and tourist attractions. San cultural centers offer visitors a fascinating insight into a way of life that has survived against the odds for thousands of years. Nhoma Safari Camp is a tented camp at Nhoma village in northeast Namibia, where members of the Jul'hoan nation teach guests the art of hunting and gathering, as well as skills including bush medicine, traditional games and healing dances. In South Africa, the !Khwa ttu San Culture and Education Centre provides day tours for visitors as well as training for modern San people who wish to become reacquainted with their traditional culture. The best way to get a sense of what life was like for the ancient San is through their surviving rock art. There are at least 14,000 recorded San rock art sites in Southern Africa – and there are likely many more that have yet to be discovered. Some of the most famous sites include uKhahlamba Drakensberg Park in South Africa (home to 35% of all South African San rock paintings) and Botswana's Tsodilo Hills. The latter was a place of great spiritual importance for the San and many of the paintings depict the sacred eland antelope. Namibia also has a wealth of San rock art including more than 1,000 sites on the Brandberg massif and approximately 2,500 petroglyphs at Twyfelfontein. The Twyfelfontein petroglyphs are particularly interesting because despite the fact that the site is located over 60 miles/100 kilometers from the sea, they include depictions of seals and penguins. This proves that the San traveled far and wide in search of food. The oldest known San rock paintings were found in Namibia's Huns Mountains. They are believed to be between 25,000 and 27,500 years old. One of the most famous examples of San rock art is the Linton Panel, on display at the South African Museum in Cape Town. One of its figures was incorporated into the democratic South African coat of arms. This article was updated and re-written in part by Jessica Macdonald on March 15 2019.